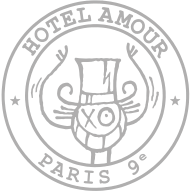 The Amour restaurant reminds us the insolent past of the 9th district called Pigalle. A real Parisian Bistrot with red leather benches and Pin Up’s shoots on the walls. In the restaurant, you can eat, drink or just seat in the exotic garden, to read a book. Parisians and tourists like to meet there, same for fashion people and artists. Breakfast, lunch, dinner or brunch on sundays and saturdays are 24/7 non stop service. All the wine is natural. The cocktail bar opens at 6pm.